The Twin Suns Foundation is an Arizona-based non-profit, and is a tax exempt organization formed in June of 2016, following the success of the Star Wars Expanded Universe Billboard Project. The organization was founded by Star Wars fans who saw the value in encouraging others to enjoy Star Wars the way they have for many years. These fans continue to run the foundation to this day. "Twin Suns Foundation is a non-profit organization using Star Wars to encourage literacy throughout the world." 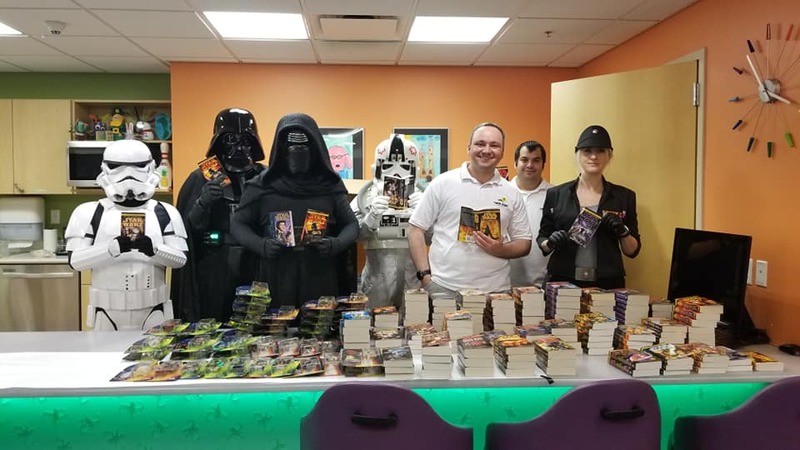 The organization is dedicated towards spreading the joy of Star Wars storytelling, especially the storytelling done in the Legends timeline, to as many new people as possible, thereby encouraging them to pick up a Star Wars novel or comic. Twin Suns Foundation is also tied to the Expanded Universe Movement which can be found on Social Media. Because of this, the foundation often uses a slogan in line with the Movement's goal of obtaining an official continuation to the Legends timeline while also ensuring a continuation of a separate Disney Canon timeline. It is our organization's deeply held belief that more Star Wars in both timelines will only be a good thing. This is not only because it will be enjoyed by the many existing fans across the world, but also because it will encourage many more to pick up a book, and even perhaps write a novel of their own one day!